Americas gateway to the universe. Leading the world in preparing and launching missions to Earth and beyond. 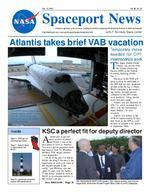 Dec. 12, 2003John F. Kennedy Space Center Spaceport Newshttp://www-pao.ksc.nasa.gov/kscpao/snews/snewstoc.htmVol. 42, No. 25(See WHITLOW, Page 5) Inside Page 8 Lighthouse restored to original 1894 specifications Page 5 Delta IV Heavy to make historic first launch Page 3 FEW get the Christmas spirit earlyA recent poll of government workers revealed that NASA is one of the best places to work in America. You wont get an argument about that opinion from Dr. Woodrow Whitlow, KSC deputy director since September. In all of the jobs Ive had at NASA, the thing I like most is the opportunity to work with some of the smartest people in the world, said Whitlow, who has spent 24 years with the Agency. I had always wanted to work at NASA as an astronaut and this is the closest I can get.KSC a perfect fit for deputy directorDR. WOODROW WHITLOW (center), KSC deputy director, and Conrad Nagel (left), chief of the Shuttle Project Office, listen to a KSC employee. Atlantis takes brief VAB vacationTemporary move needed for OPF maintenance workThe Space Shuttle orbiter Atlantis was moved from the Orbiter Processing Facility (OPF) to the Vehicle Assembly Building (VAB) Dec. 5. The move to the VAB will allow work to be performed in the OPF that can only be accomplished while the bay is empty. Work scheduled in the processing facility includes annual validation of the OPF cranes, work platforms, lifting mechanisms and jack stands. Atlantis was last launched for STS-112, which launched Oct. 7, 2002, with the International Space Stations S1 truss structure. Atlantis will remain in the VAB for approximately 10 days, then return to the OPF as work resumes to prepare it for launch in September 2004. ATLANTIS, minus its nose cap and forward reaction control system, exits the Orbiter Processing Facility en route to the Vehicle Assembly Building. SPACEPORT NEWS Dec. 12, 2003 Page 2 Awards The Kennedy UpdateJim Kennedy Center Director Seasons greetings everyone! While we have important work to accomplish, I hope everyone takes advantage of the Holiday Season to spend quality time with family and friends. I fully understand NASA is in the middle of one of its most critical times in Agency history. A great deal of hard work related to the Columbia accident and return to flight was accomplished this year, and there is still a great deal of work ahead to return our Space Shuttle fleet safely to flight. But nothing is more important than family, and any time we spend with them is time well spent. If you have children, you know how fast they grow up. Dont miss this opportunity to spend some extra special time with them, your spouse and close friends. Trust me, theyll remember that as a gift that keeps on giving. I was very pleased to see in the latest Office of Personnel Management survey that NASAKSC was listed as one of the top two government center locations for work-life balance. It shows our priorities are in the right place, and I want to congratulate everyone for that. If there was ever a contest I want us all to win every year, its the balancing the demands of work with the joys of life contest. Remember, when people are in their twilight years, nobody ever looks back on life and says, I wish I had spent more time at work and less time with my family. I know many of our people, whether NASA or contractor, are veterans and currently serve in the military Reserves. Some have even been called to duty in the Middle East this year. Please keep all of these brave men and women in your prayers, not only through the holiday season, but every day! They protect the very freedoms we allNobody ever looks back on life and says, I wish I had spent more time at work and less time with my family.enjoy. Im proud to serve with people who love our great nation so much they are willing to serve America at KSC and in the military. God bless our KSC Reservists and all of our service members fighting the war against terrorism! Finally, if you are planning a big trip or taking local day trips, please enjoy and BE SAFE, but dont overdo it. The last thing we all want is to come back to work in January to the news of a preventable tragedy involving one of our KSC family members. You know drinking and driving is forbidden, so dont even think about doing it. Remember, tragedy never takes a holiday your common sense cant afford to either. Get a friend to drive when its time to have fun and let loose. Your family and loved ones will appreciate having you home, safe and sound, for many years to come. As we close out 2003, and on behalf of Dr. Woodrow Whitlow, Jim Hattaway and my wife Bernie, Id like to wish everyone the joyous of holiday seasons and a prosperous 2004! God Bless you all!Brevard sixth graders invade KSCBREVARD SPACE WEEK gave more than 5,500 Brevard County sixth-graders the opportunity to tour the Kennedy Space Center. All students were given a family pass for a future visit. The Brevard Space Club, NASA and other contractors helped sponsor the event. These students learn about space in the Apollo/Saturn V Center. Page 4 SPACEPORT NEWS Dec. 12, 2003 Four NASA astronauts have been chosen to fly on the newly created Space Shuttle mission, STS-121. It is the mission following the Space Shuttles return to flight. Veteran astronaut Steven W. Lindsey (Col., USAF) is the commander of STS-121. Mark E. Kelly (Cmdr., USN) is the pilot; Carlos I. Noriega (Lt. Col., USMC, Ret.) and Michael E. Fossum are the mission specialists. Other crewmembers will be named later. STS-121 was added to the flight schedule to help accommodate the growing list of requirements originally assigned to the return-to-flight mission. The crew will resupply the International Space Station with equipment and consumables. The crew recently began their premission training together at Johnson Space Center. Initial activities focus on general procedural training on Shuttle and Station systems, preliminary spacewalk development and robotics training. Lindsey is a three-time Shuttle astronaut, including commanding the STS-104 mission in 2001. Kelly has flown in space once, and Noriega twice. Fossum is making his first trip. For crew biographies visit: http://www.jsc.nasa.gov/Bios.NASA names crew for new Shuttle missionSTS-121 Commander Steven W. Lindsey STS-121 Pilot Mark E. Kelly STS-121 Mission Specialist Michael E. FossumSTS-121 Mission Specialist Carlos I. Noriega No space too small for Shuttle employeesIN THE ORBITER PROCESSING FACILITY, United Space Alliance technician Jamie Haynes (left) does a gap test on the tiles of the nose of orbiter Atlantis as part of return-to-flight activities. Atlantis is scheduled for mission STS-114, a return-to-flight test mission to the International Space Station. At right, workers raise the liquid oxygen feedline for the 17-inch disconnect toward orbiter Discovery for installation. The 17inch liquid oxygen and liquid hydrogen disconnects provide the propellant feed interface from the external tank to the orbiter main propulsion system and the three Shuttle main engines. Dec. 12, 2003 SPACEPORT NEWS Page 6As a NASA-KSC University Programs Office member, Dr. Michael Freeman serves as a Spaceport Technology Research Liaison, and will continue doing so through 2004. Hired in May 2002, Freeman works under the Intergovernmental Personnel Act (IPA) funded by the Education Programs and University Research Division. As KSC moves from operations toward more spaceport technology design, testing and applied research activity, university relationships become more important, said Pamela Biegert, KSCs education director. Having faculty or graduate student researchers onsite brings fresh ideas to KSC personnel, and, in return, provides great hands-on knowledge faculty can take back to the college campus. Mike has been instrumental in communicating with the national university community to let them know what technology areas KSC has a primary interest in and how to get involved with KSC.Dr. Freeman brings universities and KSC togetherThe tenured University of Alabama faculty member functions in several leadership positions. Freeman is the director of NASAs Opportunities for Visionary Academics, which enhances scientific and mathematics literacy of future K-12 teachers. Since 1983, he served as Marshall Space Flight Centers NASA Faculty Fellowship Program co-director. Under his guidance, program involvement doubled. Freeman is continuously recognized for his teaching excellence and NASA contributions. Specifically, his dedication helped the Center gain distinction as a university and space grant leader. His representation at regional Space Grant meetings has triggered several technical partnerships. For example, a West Virginia Space Grant funded faculty to perform spaceport technology-related work at KSC for a summer. A Nebraska Space Grant financed graduate student work for a year of Center technology projects. Freeman prompted support of several education developments including mentoring programs, and generated several proposal matches between faculty researchers and KSC technical personnel. KSCs research connections with minority universities are strengthened through Freemans initiatives. He paired up a researcher at Alabama A&M University, a historically black college, with a KSC spaceport technology researcher in the area of acoustics and vibrations. Hes collaborating with the February 2004 KSC minority university conference to engage researchers in KSCs spaceport technology needs. Mike not only brought in more funding to KSC, but he also strengthened the University Programs Office personnel knowledge about how universities operate and what faculty are looking for, said Gregg Buckingham, KSCs university affairs officer. The partnership with Mike has been a great boost to our office.STANDING IN THE BACK ROW, from left, are Lee Lerner, Information Technology and Communications Services; Juan Riquelme, Cape Canaveral Spaceport Management Office; Brian Rutkowski, Spaceport Engineering and Technology; Hector Borrero, ISS/Payload Processing; and Troy Heron, Shuttle Processing. Standing in the front row, from left, are Michelle Edelman, Chief Financial Office; JoAnn Brophy, Spaceport Services; Sue Gross, Executive Staff; and Karen Crook, ELV and Payload Carriers Programs.December Employees of the MonthThe 41th Space Congress, sponsored by the Canaveral Council of Technical Societies, will be held in Cape Canaveral on April 27-30, 2004. This event gathers a significant portion of the aerospace community to discuss the status and future of space activities. The theme for this years Congress is Determination: Meeting Todays Challenges, Enabling Tomorrows Vision. Panel sessions and paper presentations will address how the combined efforts of the scientific, commercial, military and educational communities contributed in the past, and will in the future, to the growth of knowledge of space. Those interested are encouraged to e-mail abstracts, and indicate on the top of each, which technical paper session best applies. 1A Technologies for Future Spaceports and Ranges 1B Technology Solutions Delivered to Operational Space Programs 1C Commercial Use of Spaceport Technologies 2A Spaceport Materials 2B Hydrogen Research and Technology Applications 2C University Research for Future Spaceport Applications Individuals interested in submitting papers and presentations on the listed subjects must submit a 200-word abstract by Jan. 16, 2004, to: Felix A. Soto Toro, Ph.D., technical papers chairmam (e-mail: SpaceConTechPapers@kscems.ksc.nasa.gov).Help meet tomorrows space challenges Space Congress paper deadline approachingDR. MICHAEL FREEMAN, Spaceport Technology Research liason, helps partner universities and KSC in research endeavors.